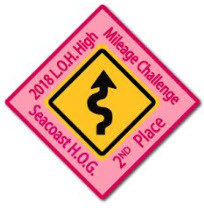 This year, L.O.H. 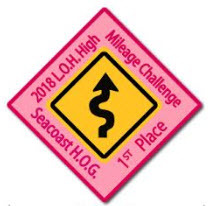 was able to re-instate our annual High Mileage Challenge for both male and female riders. 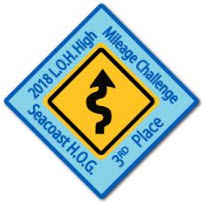 Prizes will be awarded to the three male riders (not including passengers) and the three female riders (not including passengers) with the highest amount of miles traveled in the contest time period. We also announced the When Hell Freezes Over Challenge. We asked our H.O.G. 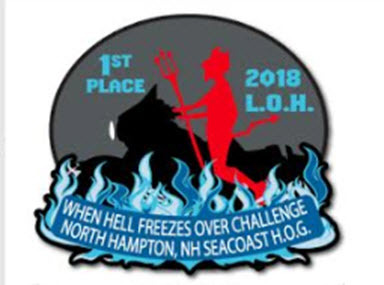 Chapter Members to ride to as many places of worship (Churches, Synagogues, etc.) and safely snap a photo of them and their bike in front of the establishment. The one bike (single rider or two up as one team) with the highest total visits wins first place. The next bike (again, single rider or two up as one team) with the second highest total wins second place. The following bike (again, single rider or two up as one team) with the third highest total wins third place. Both challenges ran April 1st to November 1st, 2018.